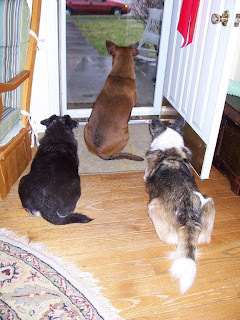 The one with the red hair and big teeth is Trudy, my seven-year-old mixed breed rescue. 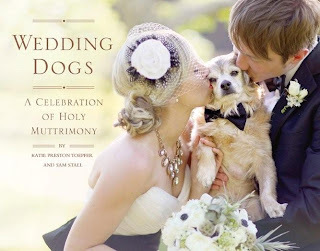 The one with the gray hair is me, Sam Stall, the 50-year-old co-author of the recently released Wedding Dogs: A Celebration of Holy Muttrimony. 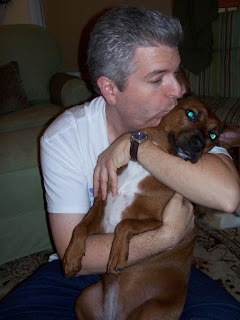 I've done about 20 books, including The Dog Owner's Guide, The Cat Owner's Guide and 100 Dogs Who Changed Civilization, plus a couple of novels: Night of the Living Trekkies and Dracula's Heir. We're relaxing on the front porch of our Indianapolis home, taking in the tulips and enjoying the first stretch of truly warm weather we've enjoyed this year. I'm sipping gunpowder black tea, purchased from a health food store just down the street called Good Earth Natural Foods. They keep it in a bin, measure it out on a scale, and sell it to me in a twist-tied baggie. Good stuff. And very invigorating. It brews into a liquid that's the color of fresh asphalt. It packs a caffeine jolt so powerful it could make a tree sloth run a 100-meter dash. Any treats for you or Trudy on this occasion? Both Trudy and I are on diets, so no goodies for either of us. I need to fit back into my summer shorts, and she needs to fit back into her collar. How did Trudy get her name? Any nicknames? My wife and I called her "puppy" for several weeks, because we couldn't settle on a name. At first we thought about calling her Ruby or Penny, because of her mostly red hair. But as her personality developed, and she turned into such an oddball, we decided to go for something funny. 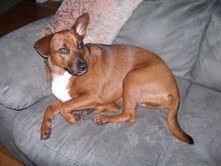 She's named after a character on the TV show Reno 911 who was also an oddball -- though not covered with mostly red hair. Her nicknames (most of them inflicted by me) include: The Big T; The Trudy-nator; Trudy-licious Trudlebug; Tru; Trudy-Booty; Boo-Bear; and Tru-Tru. How were you and Trudy united? I was visiting our veterinarian to pick up pills for one of our (now deceased) dogs when I noticed a picture of a puppy propped up near the cash register. One of the lab techs had found her tied to a cinderblock in an abandoned house, starving and covered with fleas. My wife and I met the little dog, who (at the time) was small enough to hold in one hand. The lab tech said the vet staff believed her to be a Chihuahua/Terrier mix, and that she "probably wouldn't get much bigger than 10 pounds." 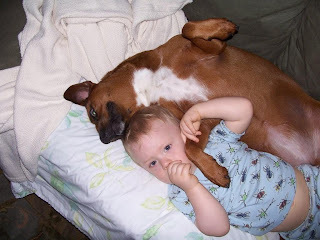 We fell in love with her and took her home, but as the weeks passed -- and Trudy got bigger and bigger -- we realized the only way she could possibly have any Chihuahua in her is if she ate one. She topped out at about 70 pounds, and appears to be some sort of German Shepherd/Pit Bull mix. But she's sweet as can be. Our six-year-old son used to ride her. Does Trudy do more to help or to hinder your writing? Mostly helps -- except when the UPS guy knocks on the door. Then she goes absolutely berserk. But here's the creepy part. She doesn't have a problem with the mail carrier or the FedEx people. Just the UPS guy. If she hears his truck going down the street, she loses it. Who are Trudy's best pet-pals? 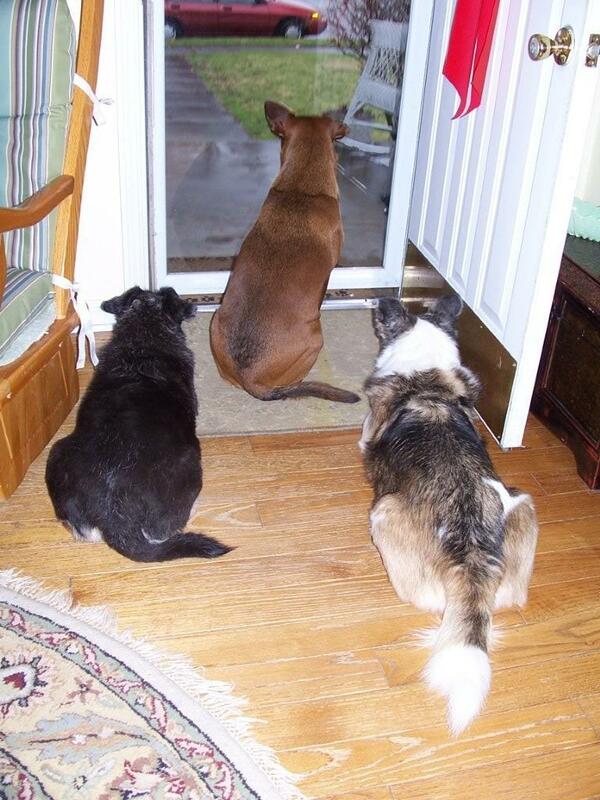 Back in the old days she hung with our two "senior" dogs, Gracie and Courtney [photo left]. Sadly, old age took both of them, so now her best bud is our son, James. Trudy has two baskets full of toys, and would happily spend the entire evening fetching them. There's just one problem. She understands the "go get it" portion of the game, but can't quite grasp the "give it back" part. So if we play fetch for say, fifteen minutes, we may toss the toy only five or six times. The rest of the session is spent trying to pry it out of her jaws. What is Trudy's best quality? Her mellow personality. She was a nut when she was a puppy, but seems to have settled gracefully into middle age. If Trudy could change one thing about you, what would it be? She'd make me more conscientious about taking her for walks. If Hollywood made a movie about your life in which Trudy could speak, which actor should do her voice? Queen Latifah. They both seem to have similar attitudes. If Trudy could answer only one question in English, what would you ask her? "Why do you dawdle over your food? Don't you like it, or are you just not hungry?" Boy were they wrong...10 lb.s vs. Trudy size! Great post! LOL funny Trudy and the UPS guy. I use to be like that with one specific postman who I hated. Great interview. Have a marvelous Monday. From a she won't get past 10lbs to 70lbs. Hahhahhahha Love that part. Great interview. Great interview, we enjoyed finding out all about you. I'am a mixed Pit Bull Sharpei.I don't give back toys either. Really enjoyed the interview! Trudy sounds like a sweetheart! Going to check out that book, also. Sounds like a great one.